I want to make sure all my FB friends that visit this page know about my website at pinevalleypress.com. In the catalog section I have been trying to add mp3 recordings of any many of my pieces as I can even those that are not available on CD. Unfortunately I am not writing any more, but I have a large body of work that I hope is still of interest. Performance materials for most works are available. 7 months 1 week ago. David Kechley shared a post. 1 year 10 months ago. Although I knew this already, I put it to the test again last night, Pasta sauce is definitely better the day after. Of course it has to be done right in the first place which we definitely did! 4 years 7 months ago. The latest buzz on COLLIDING OBJECTS. I really appreciate the comments about rhythm and melodic line which I work hard at! http://avaxhome.ws/music/classical/david_kechley_colliding_objects.html 6 years 2 months ago. Another great performance of Rush from Downunder! http://www.youtube.com/watch?v=_QqgWGhBbNE 6 years 3 months ago. David Kechley’s music is amongst the most innovative and kinetic chamber music being written today; bursting with provocative energy. Among guitarists and saxophonists his music is revered as well as feared -- unquestionably the most technically demanding this genre has to offer. Yes, the genre of guitar and saxophone. When Kechley wrote his first piece, “In the Dragon’s Garden” (winner of the 1995 Lee Ettelson Award) for this unusual combination for the World Saxophone Congress in Pesaro, Italy, there were no known guitar/saxophone duos touring and it formed the first appearance of this combination at a World Saxophone event. Since then many international duos have taken on Kechley's works for this pairing: from America – The Ryoanji Duo, Duo Montagnard, Duende and Remeleixo; from Spain – The Cuypers/Lop Duo; from Switzerland, Degre21; from Australia – Duo Histoire; from England – The McChrystal/Ogden Duo, as well as many others. They will all agree, Kechley’s is amongst the best and certainly the most demanding music for this combination. Kechley has now written five pieces for guitar and saxophone. 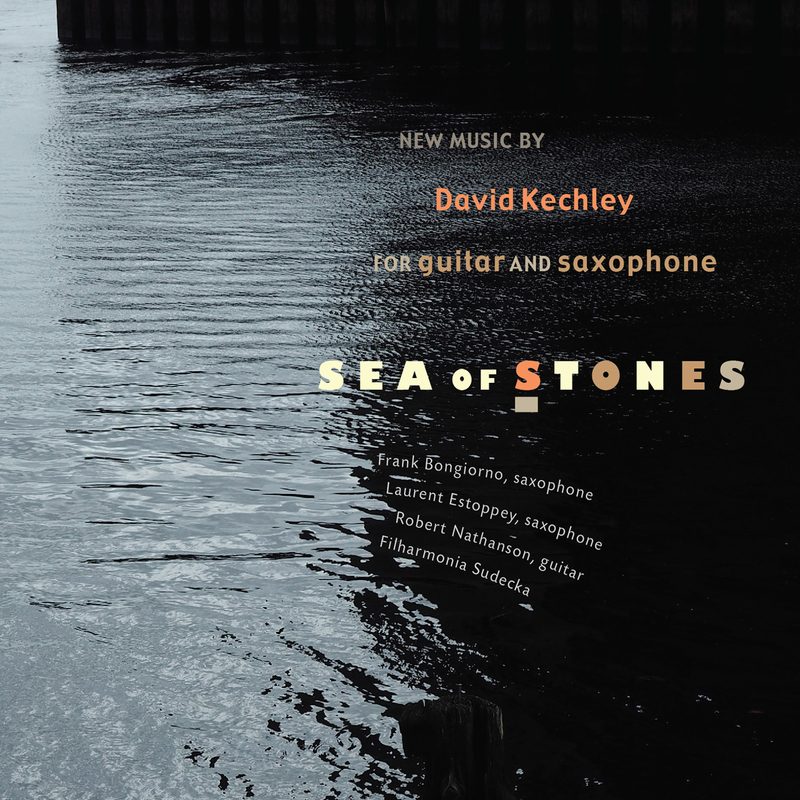 This album, Sea of Stones includes the last three: “Points of Departure,” “Bounce” and “Sea of Stones,” performed here by the Polish orchestra, Filharmonia Sudeka. “Sea of Stones”, a double concerto, extends the original “In the Dragon’s Garden” into the orchestral realm, further exploring the Japanese aesthetic of Ryoanji Temple’s rock garden. Each piece is a testament to his colorful and compelling creative accomplishments. David Kechley, originally from Seattle, lives in Williamstown, Mass., and is emeritus professor at Williams College.